Well over 100 people in California, Nevada, Arizona and Oregon observed a fireball at 5:35 p.m. PST Dec. 19. This event was unusual not for the brightness of the fireball—similar to that of a crescent Moon—but for the persistent train left behind after the object ablated. This persistent train lasted for minutes (compared to the one second duration of the fireball) and was caused by sunlight reflecting off dust particles left behind by the meteoroid as it broke apart in Earth’s atmosphere. Upper atmosphere winds distorted the train over time, giving it a curvy, “corkscrew” appearance. 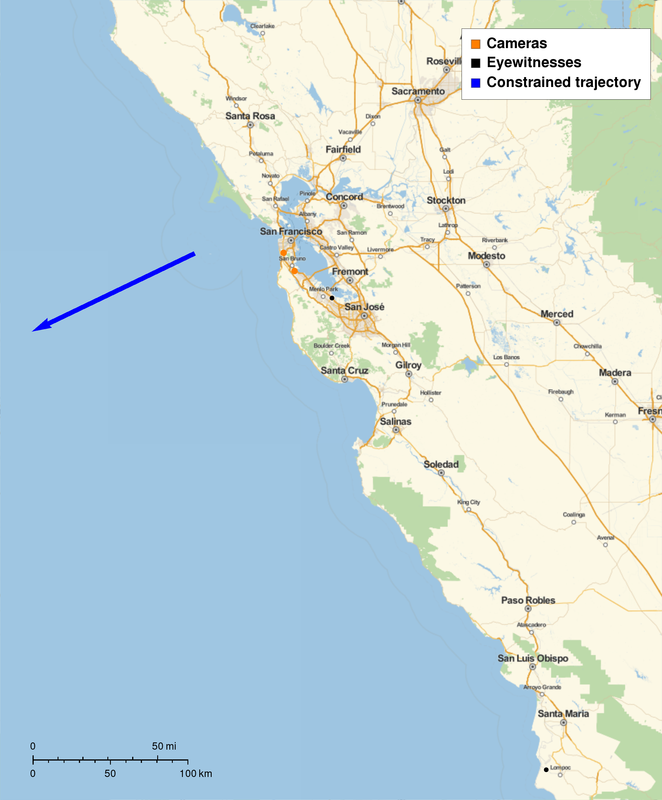 An analysis of the eyewitness accounts indicates that the meteor first became visible at an altitude of 48 miles over the Pacific Ocean some 50 miles west of the entrance to San Francisco Bay. Moving west of south at 63,000 miles per hour, it managed to survive only a second or so before ablating and breaking apart at an altitude of 34 miles above the ocean. “Ocean track” showing the path of the fireball. For videos and images of this event and the persistent train, visit the American Meteor Society website. 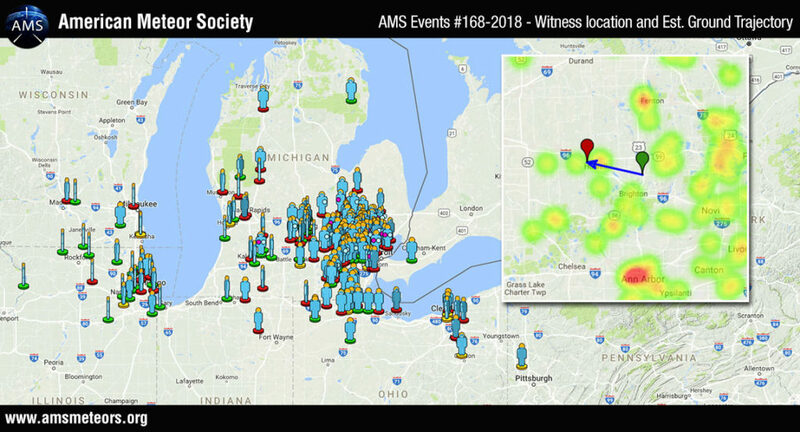 A bright fireball lit up skies over Michigan at 8:08 p.m. EST on Jan. 16, an event that was witnessed and reported by hundreds of observers, many who captured video of the bright flash. Based on the latest data, the extremely bright streak of light in the sky was caused by a six-foot-wide space rock — a small asteroid. It entered Earth’s atmosphere somewhere over southeast Michigan at an estimated 36,000 mph and exploded in the sky with the force of about 10 tons of TNT. The blast wave felt at ground level was equivalent to a 2.0 magnitude earthquake. 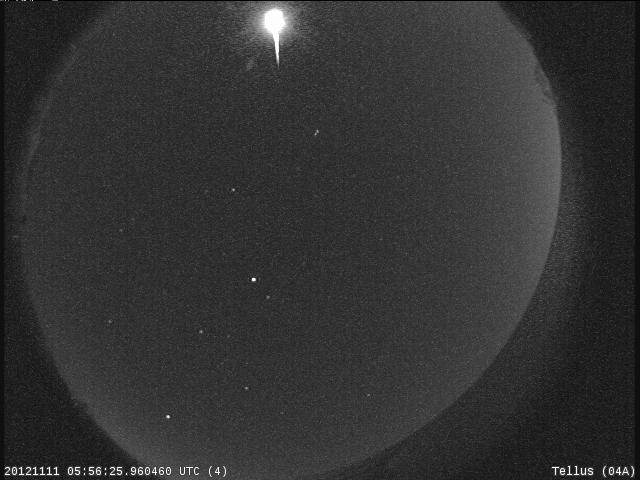 The fireball was so bright that it was seen through clouds by our meteor camera located at Oberlin college in Ohio, about 120 miles away. Events this size aren’t much of a concern. For comparison, the blast caused by an asteroid estimated to be around 65 feet across entering over Chelyabinsk, Russia, was equivalent to an explosion of about 500,000 tons of TNT and shattered windows in six towns and cities in 2013. Meteorites produced by fireballs like this have been known to damage house roofs and cars, but there has never been an instance of someone being killed by a falling meteorite in recorded history. The Earth intercepts around 100 tons of meteoritic material each day, the vast majority are tiny particles a millimeter in diameter or smaller. These particles produce meteors are that are too faint to be seen in the daylight and often go unnoticed at night. Events like the one over Michigan are caused by a much rarer, meter-sized object. About 10 of these are seen over North America per year, and they often produce meteorites. 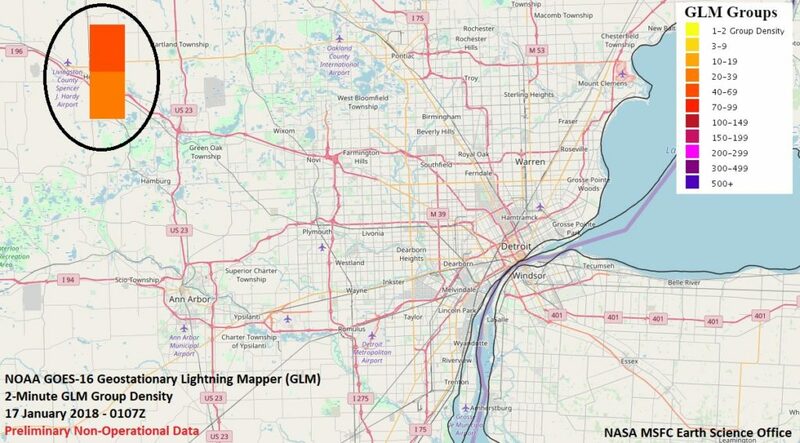 There are more than 400 eyewitness reports of the Jan. 16 meteor, primarily coming from Michigan. Reports also came from people in nearby states and Ontario, Canada, according to the American Meteor Society. Based on these accounts, we know that the fireball started about 60 miles above Highway 23 north of Brighton and travelled a little north of west towards Howell, breaking apart at an altitude of 15 miles. Doppler weather radar picked up the fragments as they fell through the lower parts of the atmosphere, landing in the fields between the township of Hamburg and Lakeland. One of the unusual things about this meteor is that it followed a nearly straight-down trajectory, with the entry angle being just 21 degrees off vertical. Normally, meteors follow a much more shallow trajectory and have a longer ground track as a result. NASA’s Short-term Prediction Research and Transition Center reported that a space-based lightning detector called the Geostationary Lightning Mapper — “GLM” for short — observed the bright meteor from its location approximately 22,300 miles above Earth. The SPoRT team helps organizations like the National Weather Service use unique Earth observations to improve short-term forecasts. GLM is an instrument on NOAA’s GOES-16 spacecraft, one of the nation’s most advanced geostationary weather satellites. Geostationary satellites circle Earth at the same speed our planet is turning, which lets them stay in a fixed position in the sky. In fact, GOES is short for Geostationary Operational Environmental Satellite. 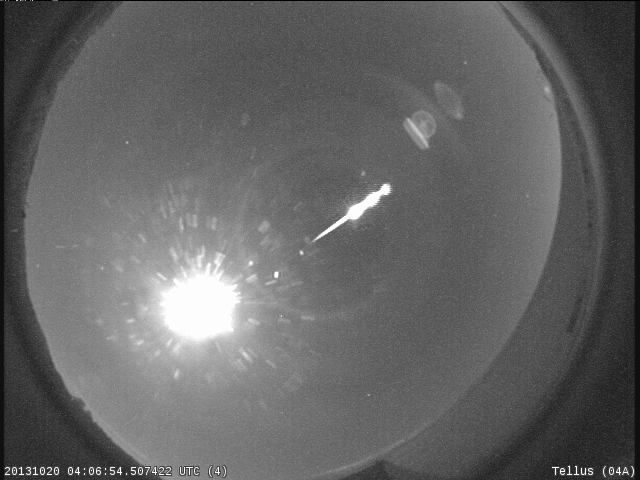 GLM detected the bright light from the fireball and located its exact position within minutes. The timely data quickly backed-up eyewitness reports, seismic data, Doppler radar, and infrasound detections of this event. At NASA, we get very excited about many astronomical events — to name just a few, the return of Halley’s Comet back in 1985/86; the impact of the fragments of Comet Shoemaker-Levy 9 with Jupiter in 1992; the Leonid meteor storms of 1998, 1999, 2001 and 2002; and, of course, the upcoming total solar eclipse on Aug. 21 of this year. Some of these events get blown a bit out of proportion. A classic example is that every time Mars comes to opposition (closest approach to Earth), the internet reverberates with the very false statement that Mars will appear as large as the Moon at that time. Nothing could be farther from the truth, as Mars, at its very closest to Earth, appears only 1/70th the apparent diameter of the Moon. This year we have a new one — reports are circulating that this year’s Perseids will be the “brightest shower in recorded human history,” lighting up the night sky and even having some meteors visible during the day. We wish this were true… but no such thing is going to happen. 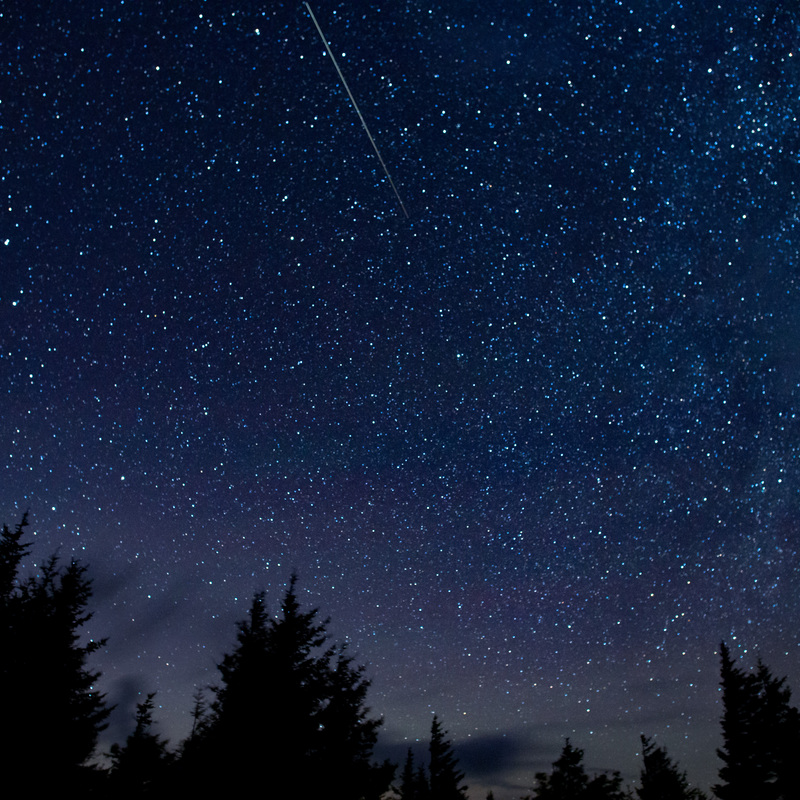 For one thing, the Perseids never reach storm levels (thousands of meteors per hour). At best, they outburst from a normal rate between 80-100 meteors per hour to a few hundred per hour. The best Perseid performance of which we are aware occurred back in 1993, when the peak Perseid rate topped 300 meteors per hour. Last year also saw an outburst of just over 200 meteors per hour. This year, we are expecting enhanced rates of about 150 per hour or so, but the increased number will be cancelled out by the bright Moon, the light of which will wash out the fainter Perseids. A meteor every couple of minutes is good, and certainly worth going outside to look, but it is hardly the “brightest shower in human history.” The Leonid meteor storms of the late 1990’s and early 2000’s were much more spectacular, and had rates 10 times greater than the best Perseid display. Now, THAT’s a meteor shower. The 1833 storm had a profound effect on those that witnessed it; it also gave birth to modern meteor science. Those of us who study meteors dream of such a display happening sometime within our lifetimes. But it won’t be caused by this year’s Perseids. Cooke leads NASA’s Meteoroid Environment Office at the agency’s Marshall Space Flight Center. Make plans now to stay up late or set the alarm early next week to see a cosmic display of “shooting stars” light up the night sky. Known for it’s fast and bright meteors, the annual Perseid meteor shower is anticipated to be one of the best potential meteor viewing opportunities this year. The Perseids show up every year in August when Earth ventures through trails of debris left behind by an ancient comet. This year, Earth may be in for a closer encounter than usual with the comet trails that result in meteor shower, setting the stage for a spectacular display. 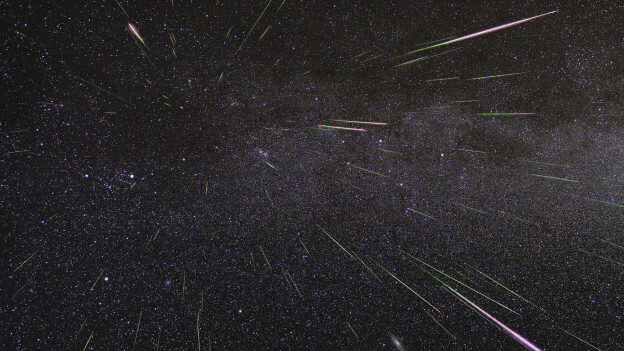 An outburst is a meteor shower with more meteors than usual. The last Perseid outburst occurred in 2009. The best way to see the Perseids is to go outside between midnight and dawn on the morning of Aug. 12. Allow about 45 minutes for your eyes to adjust to the dark. Lie on your back and look straight up. Increased activity may also be seen on Aug. 12-13. For stargazers experiencing cloudy or light-polluted skies, a live broadcast of the Perseid meteor shower will be available via Ustream overnight on Aug. 11-12 and Aug. 13-14, beginning at 10 p.m. EDT. Read more about the Perseids here. 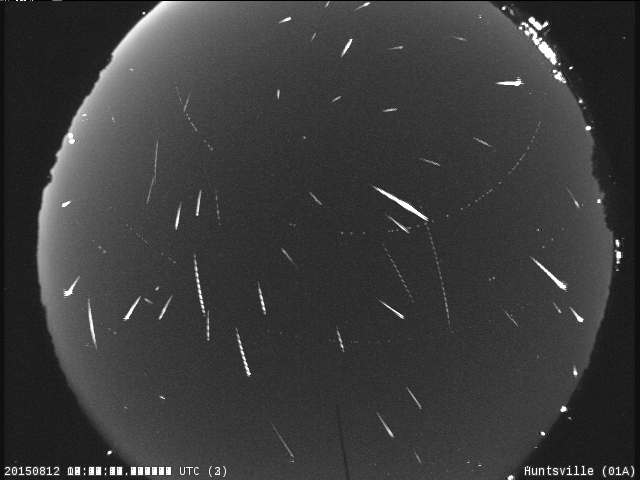 An outburst of Perseid meteors lights up the sky in August 2009 in this time-lapse image. Stargazers expect a similar outburst during next week’s Perseid meteor shower, which will be visible overnight on Aug. 11 and 12. For a few seconds early Thursday, night turned into day as an extremely bright fireball lit the pre-dawn sky over much of Arizona, blinding all-sky meteor cameras as far away as western New Mexico. Based on the latest data, a small asteroid estimated at 5 feet (1-2 meters) in diameter – with a mass of a few tons and a kinetic energy of approximately half a kiloton – entered Earth’s atmosphere above Arizona just before 4 a.m. local (MST) time. NASA estimates that the asteroid was moving at about 40,200 miles per hour (64,700 kilometers per hour). Video obtained from the NASA meteor camera situated at the MMT Observatory on the site of the Fred Lawrence Whipple Observatory, located on Mount Hopkins, Arizona, in the Santa Rita Mountains. NASA’s All Sky cameras captured this image of a Quadrantid meteor overnight, the meteor was moving at 93,000 miles per hour. This 1 inch diameter member of the Quadrantid meteor shower leaves a brilliant streak in the north Georgia skies before burning up 44 miles above Earth’s surface. The Quadrantid meteor shower peaks overnight on January 4. The Geminid meteor shower peaks on the night of December 13 through the morning of December 14. 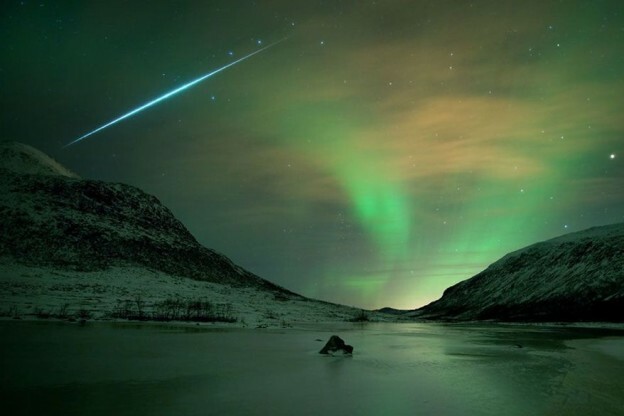 Geminid rates can get as high as 100 per hour, with many fireballs visible in the night sky. Best viewing is just before dawn. On the night of December 13, astronomer Bill Cooke from the Meteoroid Environment Office at NASA’s Marshall Space Flight Center will answer questions about the Geminid meteor shower via a live tweet chat. To ask questions, simply use the #askNASA or @NASA_Marshall. Cooke, Rhiannon Blaauw and Danielle Moser will be available to answer questions between the hours of 10 p.m. CST, beginning the evening of December 13, until 2 a.m. December 14 CST. The best opportunity to see the Geminid Meteor shower is during the dark pre-dawn hours of December 14. For optimal viewing find an open sky – because Geminid meteors come across the sky from many all directions. Geminids are pieces of debris from an object called 3200 Phaethon. Long thought to be an asteroid, Phaethon is now classified as an extinct comet. Basically it is the rocky skeleton of a comet that lost its ice after too many close encounters with the sun. Earth runs into a stream of debris from 3200 Phaethon every year in mid-December, causing meteors to fly from the constellation Gemini. When the Geminids first appeared in the early 19th century, shortly before the U.S. Civil War, the shower was weak and attracted little attention. There was no hint that it would ever become a major display. #1. The Geminid meteor shower can be seen from both the Northern and Southern hemispheres. Because they are pieces of an asteroid, Geminid meteoroids can penetrate deeper into Earth’s atmosphere than most other meteor showers, creating beautiful long arcs viewable for 1-2 seconds. Click the image to view a Geminid in action. Marshall Space Flight Center will host a live Tweet Chat from 10 p.m. Dec. 13, until 2 a.m. on Dec. 14. Meteor experts Dr. Bill Cooke, Danielle Moser and Rhiannon Blaauw, all from NASA’s Meteoroid Environment Office, located at Marshall, will stay up late answering questions via Twitter. NASA followers interested in joining the online conversation can tweet their meteor questions to the Marshall Twitter account, @NASA_Marshall, or simply tag their tweets with #askNASA. #2. Geminids are pieces of debris from an object called 3200 Phaethon. It was long thought to be an asteroid, but is now classified as an extinct comet. Phaethon’s eccentric orbit around the sun brings it well inside the orbit of Mercury every 1.4 years. Traveling this close to the sun blasts Phaethon with solar heat that may boil jets of dust into the Geminid stream. Of all the debris streams earth passes through each year, the Geminid shower is the most massive. When we add up the amount of dust in this stream, it outweighs other streams by factors of 5 to 500. Click the image to view a Geminid in action. #3. Because they are usually bright, many people say Geminid meteors show color. In addition to glowing white, they have been described as appearing yellow, green, or blue. Geminid meteoroids hit earth’s atmosphere traveling 78,000 mph or 35 km/s. That may sound fast, but it is actually somewhat slow compared to other meteor showers. #4. Geminids are named because the meteors seem to radiate from the constellation of Gemini. The shower lasts a couple of weeks, with meteors typically seen Dec. 4-17, peaking near Dec 13-14. Click the image to view a Geminid in action. #5. The Geminids started out as a relatively weak meteor shower when first discovered in the early 19th century. Over time, it has grown into the strongest annual shower, with theoretical rates above 120 meteors per hour. The Taurid Swarm is Upon Us! Every year from September-November, the Earth passes through a broad stream of debris left by Comet Encke. The dust associated with the comet hits the Earth’s atmosphere at 65,000 mph and burns up, creating the Taurid meteor shower. Most years the shower is weak, and only a few Taurid meteors can be seen each night. 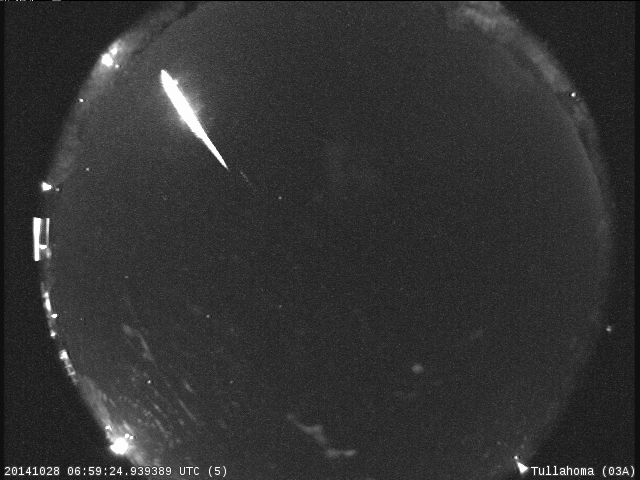 Other years, the Taurids can put on a show. This year, the Taurids may be more active than usual. Bright Taurid fireballs may be more numerous this year, according to some scientists. Known as the Taurid “swarm,” these bright meteors are created when the Earth runs into a group of pebble-sized fragments from the comet that then burn up in the atmosphere. Taurid meteors can be seen any time the constellation Taurus is above the horizon during the months of September, October, and November. The best time to look for Taurids is after midnight, when Taurus is high in the sky, and when the sky is dark and clear, with no moonlight to mask the fainter meteors. Given the behavior of past Taurid swarms, increased fireball activity may be seen during the last week of October and the first two weeks of November. A bright Taurid fireball recorded by the NASA All Sky Fireball Network station in Tullahoma, Tennessee in 2014. 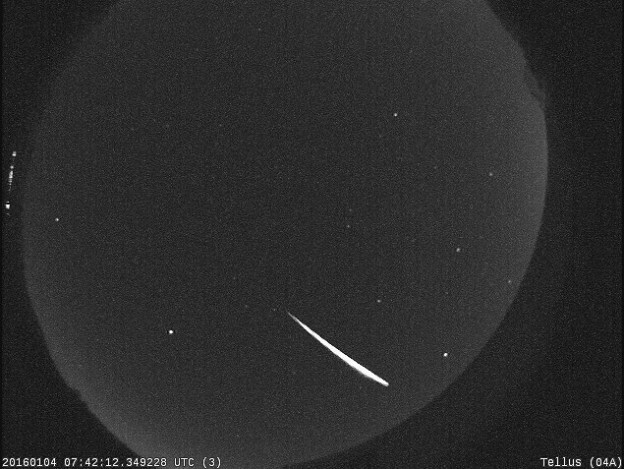 A bright Taurid fireball recorded by the NASA All Sky Fireball Network station in Cartersville, Georgia in 2012. 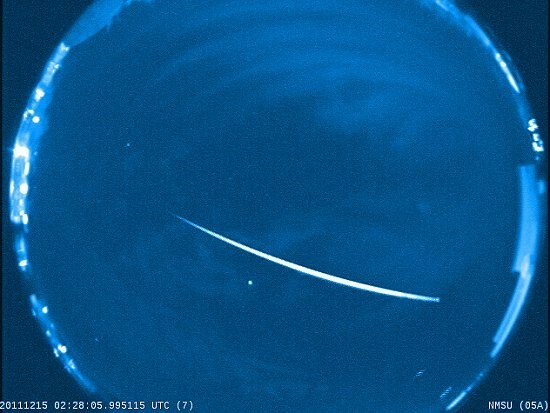 A bright Taurid fireball recorded by the NASA All Sky Fireball Network station in Cartersville, Georgia in 2013. The bright orb is the Moon. Author Marshall Space Flight CenterPosted on October 26, 2015 Categories MSFC Meteoroid Environment OfficeTags all sky camera, Comet Encke, Marshall Space Flight Center, Marshall Space Flight Center Meteoroid Environment Office, meteor, meteor shower, NASA, Taurid meteor8 Comments on The Taurid Swarm is Upon Us!